The thought of drinking beer that is dispensed from a can is antithetical to the desire of most people who enjoy good beers. I was once one of those people. I imagine that this aversion to drinking canned beer stems from the quality of the beer (and calling it beer is quite generous) that is usually found in the aforementioned cans. Cans are reminiscent of beers like PBR, Bud, and Schlitz. Just knowing that the tag line, “Just a Kiss of the Hops” was an attempt to make Schlitz appealing is appalling Because of these dreadful drinks canned beer unfortunately, still has a negative connotation today. Canned beer has some advantages over their bottled brethren. The most popular misconception for the cause of a beer to go bad is temperature change. While wide temperature fluctuation will contribute to spoilage, it is secondary to the biggest contributor to beer spoilage: light. Most companies that care about the taste of their beer and the palate of their consumer will use the dark brown bottles that are thankfully nearly ubiquitous today. They filter out a good portion of light. The green bottles filter much less light than the brown bottles and the clear bottles obviously don’t offer any protection at all. So, what’s even better than brown bottles? Cans. Canned beer doesn’t let in any light and it has the additional advantage of having a better seal than bottled beer, which contributes to superior containment of carbonation. This is all well and good, but if the beer inside the can is still abysmal, all of these advantages are for naught. Fortunately, there are a handful of breweries like Oskar Blues and 21st Amendment that can their beers exclusively and their beer is outstanding. This is of course our segue to our beer of the week, Back In Black by the aforementioned 21st Amendment Brewery. When Harry recommended a 21st Amendment beer I was excited. 21st Amendment has some fantastic brews. I experienced twice the anticipation as I had never before quaffed a black IPA. The pour lived up to my expectation. It pours quick and clean…and black. However, my first thought was, “This isn’t right it’s too thin, but then I remember I’m not looking at a porter; I’m pouring a pale ale. The head is light, thick, and and a very light tan, Thankfully it is not as creamy as it would appear to taste. The beer is dark. It’s really dark; it’s not stout dark, but I would be fooled without a close inspection. As the head slowly dissipates there is a firm and lingering lacing in the glass. As I bring the glass to my nose, my initial anticipation of malt was correct. There is a thin malt nose that has bits of pine brightness from the hops that come through. Surprisingly, it doesn’t have that strong nose that you would expect from a pale ale. However, the dark malts that are used for this beer are evident from the nose to almost the finish. The malt keeps the beer slightly sweet, but there are hints of earth, unsweetened chocolate, and pine from the hops to balance the beer. I really enjoyed the transition of tastes. It’s slightly sweet up front, balanced in the middle and finishes slightly (the can proclaims that Back In Black weighs in at 65 IBU, but I find that number to be a bit high) bitter. I like the beer, but I don’t love it. Despite the labeling I don’t think that the IPA designation is a proper one. There is a distinct lack of boldness that one would expect from an IPA. 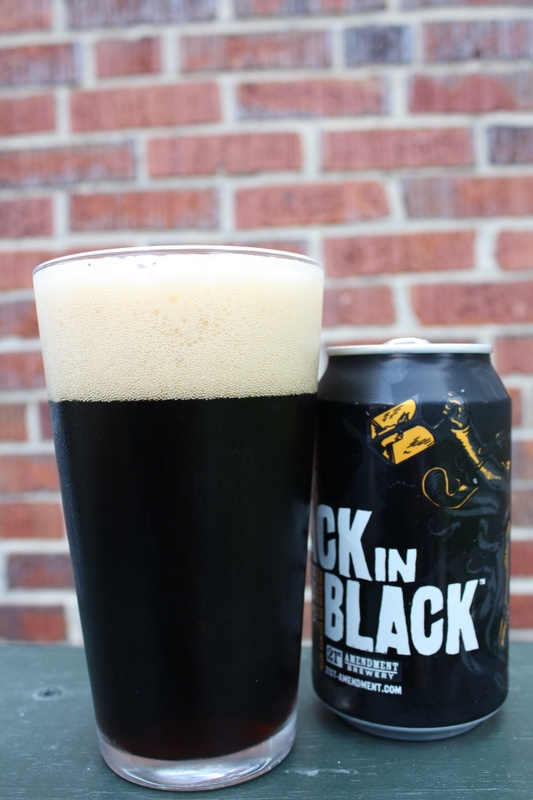 With the heavy usage of dark malts, Back In Black is much closer to an American Pale Ale style than an India Pale Ale. I wish 21st Amendment had been more aggressive and liberal in their use of hops. Not only would more extensive hopping have given Back In Black the more robust nose it needed, but it would have also brought the beer more in line with an IPA style. The limited hopping is also evident with the lack of complexity in this beer, which is diametrically opposite with many of the other 21st Amendment brews. This is a fun beer, but I won’t be running out to stock this in my secret stash. It is a novel beer and I like the thought behind it, but to hit the mark you need to deliver on the expectations given. As I finish my glass, I will go to the box and grab 21st Amendment’s Brew Free or Die IPA to remind myself that there are some outstanding canned beers. ~ by its12oclocksomewhere on August 12, 2010.